Fibropapillomatosis (FP) is a deadly disease that may be linked to pollution in the oceans and nearshore waters, and is generally found in turtles that inhabit polluted waters with poor circulation, such as the Indian River Lagoon in Florida. Originally, FP was thought to be caused by a type of flatworm, but research now shows that this disease is related to the herpes virus. FP is an infectious disease which is disseminated through horizontal transmission, meaning it can pass from species to species either directly or indirectly. Possible factors contributing to the spread of FP include: parasites, bacteria, environmental pollutants, UV-light, changing water temperatures and biotoxins – all commonly found in polluted waters. It is found most often in juvenile green turtles, but also exists in all other species. Turtles infected with FP develop tumors over their eyes, mouth, nose, and flippers – really any area that has soft tissue. These growths can significantly compromise mobility, which can make evading predators or catching prey quite difficult. Tumors over the turtle’s eyes can limit or inhibit sight, whereas tumors in or near the mouth can limit food consumption – both which can take a great toll on the turtle’s overall health. These growths may also be internal, infecting vital organs such as the lungs and stomach. Because of this intrusion in natural internal functioning, FP can ultimately lead to starvation and even death. The tumors themselves are benign and may regress over time, however. If discovered in time, most often the tumors are removed surgically by veterinarians to restore function to vital organs and flipper mobility. Once thought to be contained to green turtles in Hawaii, FP is now affecting turtles around the world – it has been reported in Brazil, Texas, Australia, Florida, and now, North Carolina. 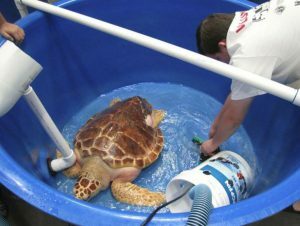 In fact, the Karen Beasley Sea Turtle Rescue and Rehabilitation Center has cared for several turtles diagnosed with FP over the last couple of years. Many precautions – including having infected turtles on their own water supply – have to be taken in order to keep other turtles from being infected. Currently, there is no cure for this disease and conservation organizations are working hard to establish a resolution to this problem, as well as clean up polluted waterways where large sea turtle populations are affected. If you would like to lend a helping hand and adopt a sea turtle through the Karen Beasley program, visit their site here.